You know the feeling you have when you can just tell that something really, really bad is about to happen? The latest issue of the Amazing Spider-Man is here to induce all the wonderful anxiety that comes with Dan Slott’s final story with the wall-crawler. At last, Go Down Swinging is in motion; this book is no longer stalling too reach the big 800 nor setting up the pieces for what’s ahead. It’s probably why this was the most enjoyable issue for me in a while. Spoilers incoming. 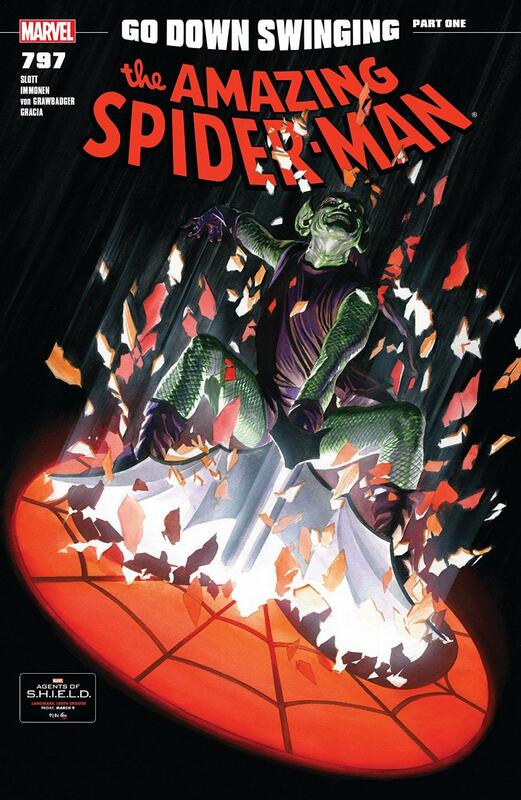 In this issue, Slott tries to keep us on our toes by manipulating the cuts between Norman Osborn’s interrogation of a mystery victim and Peter’s double life routine. It’s supposed to misdirect us; we’re supposed to think that Mary Jane is the one that’s been captured. Sadly, I feel like this pulling the rug out from under our feet could have been handled a little more elegantly. Unless I missed something, the reveal that the victim is actually none other than J. Jonah Jameson isn’t backed up by any logical series of events. When you pull the ol’ switcharoo on your audience, you’re supposed to replace what they had with something just as good, if not better, and give a believable explanation as to why it wasn’t what we thought but still looked the way that it did. The replacement is fine (I’m sure Mary Jane is gonna kick the bucket. Just give it a minute. ), but we never actually see Norman pick up on the fact that J.J.J. has any sort of connection to Spider-Man, while we do see him witness Spider-Man leaving MJ’s apartment. This framing does at least give Norman more time to speak almost uninterrupted, and I have to admit, he hasn’t even revealed himself as the Red Goblin yet and he’s pretty intimidating. I certainly didn’t expect to see him bite the head off a rat. It’s that kind of unpredictability that makes for a great villain. I do wonder if he swallowed it or just spit it out…. On another note, some of you may remember how excited I am to see Peter and Mary Jane back together. Well, just as fast as it came, it’s gone. I would say that if Slott wanted them to be on and off, he should have started it sooner, but the way the script is now makes me think that he just doesn’t enjoy writing her. I think he didn’t want to deal with her in the pages of Iron Man, so he got her over here at the last second. There’s just nothing that makes me understand that Mary Jane would have at all forgotten what trouble comes with dating Spider-Man when just last issue she was so clearly happy to be covering for him. It’s not just Norman’s menacing words that make this issue as good as it was, though. Penciler Stuart Immonen and inker Wade von Grawbadger make him look creepier than I’ve ever seen him. His smile, his eyes are shown in a way that will make you scared of what he’s going to do before you even read what he has to say. The silhouette of him biting off the rat’s head is jarring and unsettling. I’m normally more for the brighter sections of a book, but what colorist Marte Gracia brings to the table is just so much more unique – so much more memorable here. The shadows and the light of a jack-o-lantern on Osborn’s face always create a campfire ghost stories vibe that is to be taken seriously and absolutely pulls it off. The panel of Peter and Mary Jane kissing is brought down by the presence of Mary Jane’s third elbow, but Gracia saves it with beautiful lighting that add a whole new layer to what was there before. The light that falls on her hair and her shoulder, the light that shines between their necks, all placed in a way that’s very believable and mesmerizing. Slott’s script might not support it, but it actually does make me believe that theirs is some romance between them. I realize that it sounds like I ragged this book more than I praised it, but the criticisms I’ve mentioned were just things that I thought were worth noting that I found myself able to expand upon. Overall, I do think this is a better issue than the last several have been. Norman Osborn’s presence is just very entertaining in way that makes you want to turn your head away but keep your eyes on him, and the art team goes the extra mile in making you want to punch him in the face. If the concept of the Red Goblin has piqued your interest at all, I would say give this a shot. He doesn’t make his full debut just yet, but the foundations are there and will leave you satisfied.